Okay, time waits for no one. So we got to keep moving and try not to panic. Loco, the author, had mentioned something about Ken Kesey's One Flew Over the Cuckoo's Nest. Not too many people have seen the movie recently and fewer have probably read the book. Damngoodread. For people who are kind of fuzzy on who Kesey is (or was) he more or less lit it up with a bunch of fairly sharp minded folks, contributing to some tectonic social shifts. When people think of Kesey, they might be more prone to recall The Electric Kool-Aid Acid Test. Although I found Wolfe's telling of the story fun, that's a book I never finished. Interesting enough, but that's not where this post is going. Where this is headed is toward the Titicut Follies. When there was more leisurely time to ponder the Internet without much in the way of direction, I came across a few clips from the movie that, quite frankly, blew me away. When I saw my first clip, I was like, "Wow, that is so much like Cuckoo's Nest." I'd even imagined that Kesey had written the book after seeing the move. Wrong. Screw google for now. If memory works, Kesey was inspired by what was going on on the west coast. He wrote his book in 1962. 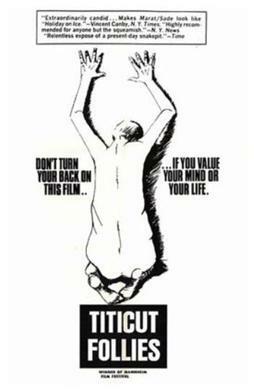 Titicut was shot in 1967. Cuckoo's nest was probably in 1975. If you ask me, the guy is okay. He makes perfect sense. The reason this sticks out, and recently, is because of a few thought-streams that cross. One is this. Also, there was an "Odds n' Ends" link at the bottom of a solid blog by Charisma Man's worst nightmare (link it later). The blog-link directed to a picture of Stewart Brand as a young man. There are a few other currents, but time is short at the moment. This may all start to make a little more sense in the not-so-distant future. Which is kind of what this is all about. The future is happening fast, all around us. I'm just starting to notice people 'saw' this happening. And it's not just me. Unfortunately, the video links no longer connect. Here's another one. Don't know how long it will be work. Enjoy your 'forced meds'.